Like anyone with any sense I read Alan Levine’s blog religiously. It has given me more ideas to think about and play around with than any other site on the Internet. The other day I read Share Images By Email to SPLOT Collector (this post is now well down the post list as Alan blogs like a manic). I was very interested in this, as I’d loved posterous until it was abandoned. One of the main things I liked about posterous was the posting by email facility. This allowed me to publish photos from my phone even with a terrible connection. I first noticed this on holiday in Galloway when I didn’t see a signal all week. I did keep my posterous updated with photos because the mail app on my phone magically seemed to be able to find a signal when I was asleep and send the photos over. I’d got it in the back of my mind to replicate this behavior with WordPress sometime, Alan’s post gave me the details of how to and the impetus to do it. I’ve already got a reclaimhosting account for quickly setting up things to play with. It took me a quick 5 minutes to install wordPress, set the theme to the one Alan recommended (Fukasawa by Anders Norén), add the Jetpac plugin to handle mail, another plugin (Auto Thumbnailer) to automatically use images as featured images and add a css tweak. All following Alan’s instructions. This had me covered for the main features of posterous, post via email and handling images in a pretty way. a bit more for that. Another couple of minutes. The system seems to be working just the way I wanted and yesterday I added a couple more features. 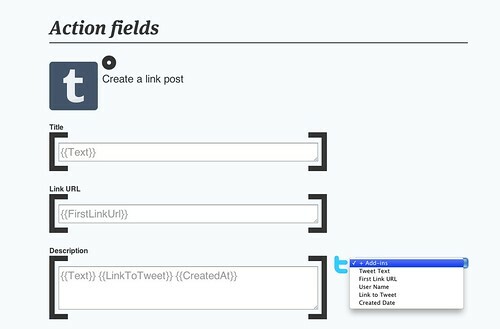 Posterous had an interesting feature that allowed you to automatically forward whatever you posted to other services. 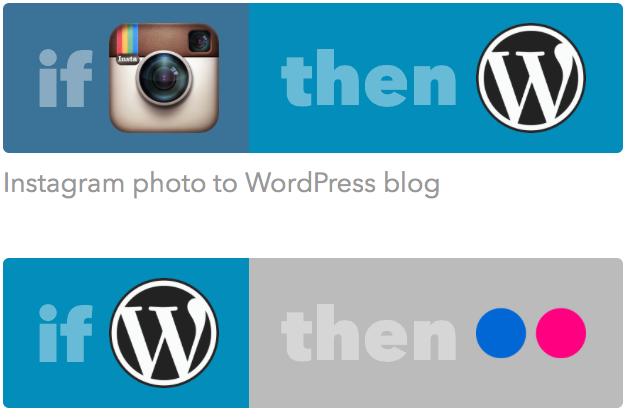 I had a quick search for a WordPress plugin to do this but ended up at ifttt.com. 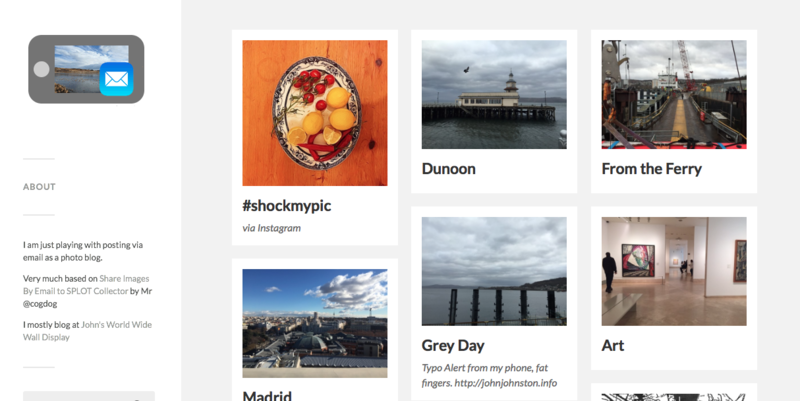 There I found: Post WordPress Featured Image to Flickr. This just deals with the first image, but a quick test proves it works. I’ll probably explore posting all the images later. While I was on ifttt I also notice Instagram photo to WordPress blog so have thrown this into my mix. I can now post to Instagram, have that picture added to the blog and also sent on its way to flickr. Apart for the sheer fun of doing this, it also fit in quite well with the POSSIE, own your own space agenda. Alan’s SPLOT | Smallest Possible Learning Open Tools project is fascinating. Just discoverd a nice IFTTT Recipe: ifttt / Recuperating the mp3 files from an audioboo RSS feed, This recipe will collect the mp3 files of an audioboo RSS feed and put them into a dropbox folder, it allows you to name the folder from item on the feed. I set it up for the boos tagged edutalk that we gather and post to EDUtalk. I’ve now got a local backup mechanisim. Cleaver stuff, I wish, and have feature requested, that IFTTT could get enclosures from RSS feeds, but this is a great workaround for backing up audioboos. I am also wondering how this could be combined with Wappwolf. A couple of weeks ago I watched Doug‘s video How I Use a MacBook Pro on of the ways he discussed was a very new (beta) service ifttt. ifttt stand for If This Then That and I requested a beta invite that arrived a day of three later. I’ve now had a look over the site and set up my first task. This is a simple one, if I tag a link on delicious with @comment it will be tweeted (Hopefully with commenting at: ). I post @comment tagged links to delicious with a keyboard short cut so the whole thing should be painless. This is a really trivial use of ifttt, and I can see a lot of more powerful uses for the service. I like this sort of thing, the way posterous post stuff on to flickr, twitter and this blog for example. We also do a little of the same sort of thing with edutalk.cc, auto posting audioboos tagged edutalk to the moderation queue. In fact my first thoughs were that ifttt could replace my rather clunky system for doing this. Unfortunately, at the moment ifttt only supports posting text to your main posterous blog and as far as I could see will not post to the moderation queue. I was also looking at posting my shared google reader to a new posterous blog but as it is not my mail one this will not work yet. I am saying yet as the service seems to be developing quickly. I did manage to create a task to post my google reader shared items onto my tumblr blog (I’d almost forgotten that one). I usually star/like stuff in google reader to check later but will now try to share ’em too to see how ifttt works out. I am looking forward to seeing how ittt develops. Update:I seem to have flooded ScotEduBlogs with my tumblr posts. I’d forgotten that it was listed there. Apologies. I’ve now removed the blog from SEB.